We are based in Victoria, British Columbia Canada. 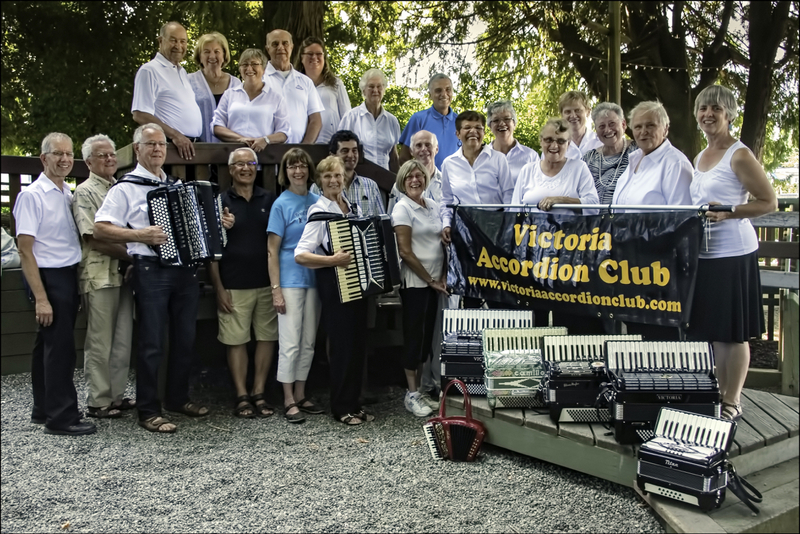 Our aim is to enjoy the accordion, the music of accordions, and the people who create it. Please visit our website for information on our activities, past, present or planned. Just click on the heading tabs in the menu bar to learn more, or to contact us. For the latest news or update on activities, click on the headings in the top menu bar. For samples of our band performances, click on the heading “Club Events, Activities, Performances”. Keep updated on our activities — visit our FaceBook site! For our 2019 performance year, we have a number of formal events scheduled. Some events are ticketed, some are by donation, and others are free. All events are at Sidney’s Shoal Centre on Resthaven Drive unless noted differently. We finished a very busy season of performances in 2018. We are planning our 2019 season, and will post upcoming dates here when they are confirmed. Hear a CBC documentary on the reviving respect of the accordion. Come visit us at our monthly jam session on the first Sunday of each month. (**except on statutory holidays). We meet at the Sidney Shoal Centre, 10030 Resthaven Drive, Sidney, BC (see website). Bring your accordion if you play it, or just yourselves if you don’t! Our jam session starts about 2:30 pm. See you there.